This site is produced by Anglican Media Sydney, the media and communications arm of the Sydney Diocese. 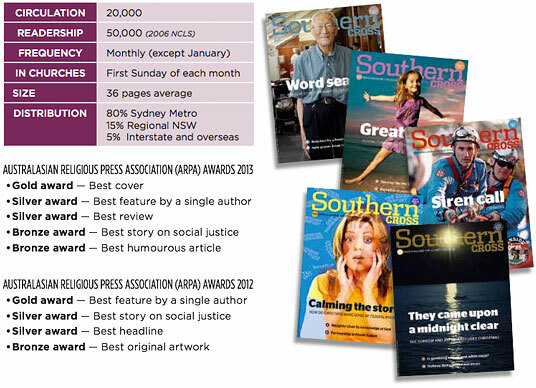 We also publish SOUTHERN CROSS - the official publication of the Sydney Diocese. targeted, effective advertising is more important than ever. Contact Kylie Schleicher for bookings or enquiries on email or call 8860 8850. Sydneyanglicans.net averages annual visits of 650,000 and 1.6 million pages viewed/year. (source: Google Analytics). A one year subscription is just $44 per annum and includes postage, handling and GST. A two year subscription costs $70. We accept all credit cards, or we can invoice you for payment by cheque or money order. To subscribe please call Garry Joy our Subscriptions Manager on +61 2 8860 8861 or email your name and address details to this email.